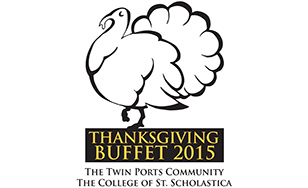 The 26th annual Twin Ports Region Thanksgiving Buffet, produced by Twin Ports community volunteers and St. Scholastica, will be held from 11 a.m. to 4 p.m. on Thanksgiving Day, Thursday, Nov. 26, at the Duluth Entertainment and Convention Center. A favorite local tradition, the annual event ushers in the season by offering a free turkey dinner with all the trimmings to Twin Ports residents. In addition to the main event at the DECC, community members can also enjoy a Thanksgiving meal at satellite locations in Carlton, Cloquet and Two Harbors, and homebound Twin Ports residents can order home deliveries. An estimated 6,000 meals will be served this year, including 1,300 meals that will be delivered. "This event is really about honoring a tradition of helping people in need and fostering a sense of community," said Monica Hendrickson, event coordinator. "It's a humbling experience for many who volunteer at the event - it's incredible to watch our communities come together to benefit the many in need." The Thanksgiving Buffet provides an opportunity for St. Scholastica to put into action its Catholic Benedictine Values, Hendrickson said, such as community and hospitality. The College partners with many local businesses and organizations, along with hundreds of dedicated volunteers, to make the event a success. The meal features locally grown and locally provided foods as much as possible. All leftovers are donated to the Second Harvest Northern Lakes Food Bank, and much of the buffet's waste is recycled. In addition to the holiday meals, there will also be musical entertainment, a children's craft corner and a visit from Santa. "We are so thankful to all of our donors and volunteers who have made this community event possible," Hendrickson said. "No one should be alone or unable to provide a meal to their loved ones on this special day of Thanksgiving. It's all about giving back and we hope we can continue this tradition for years to come." Every year, the dinner is dedicated to a long-term supporter of the event. This year, it was a unanimous decision to name St. Scholastica President Larry Goodwin as the honoree. Goodwin will be retiring from the college in 2016. During his tenure, he has made it his commitment to help people in need in the community. CHUM Drop-In Center, 125 N. 1st Ave. W.
Damiano Center, 206 W 4th St.
Royalton Manor, 1901 New York Ave.
Clifford Lund Apartments,914 Tower Ave. Solid Rock Mission,1004 N. 6th St.
Carlton - 11 a.m. to 2 p.m. at the Public House (Formerly Cozy Café), 214 Chestnut Ave.
Two Harbors - 11 a.m. to 2 p.m. at Two Harbors Moose Lodge, 709 First Ave.
(218) 723-6484 for Duluth/Superior/Two Harbors deliveries. Requests must be received by 4 p.m. Friday, Nov 20. (218) 879-9238 for Carlton/Cloquet deliveries. Requests must be received by Monday, Nov 23. Monetary donations are welcome. Please send to: The College of St. Scholastica, attention: Thanksgiving Buffet, 1200 Kenwood Ave., Duluth, MN 55811.